Το “The Clumsies” ανοίγει το Bar του και υποδέχεται για δύο μέρες (24-25 Φεβρουαρίου) τον Erik Lorincz, Head Bartender του American Bar από το ιστορικό ξενοδοχείο Savoy του Λονδίνου. Ο τρόπος πληρωμής γίνεται κατόπιν συνεννόησης μετά την καταβολή για επικύρωση της θέσης σας στο σεμινάριο. “The Clumsies” open their gates and kindly welcome Erik Lorincz, Head Bartender of the Historic American Bar Savoy Hotel, London on 24th and 25th of February. Erik Lorincz is only 36 and has one of the most enviable positions in the industry, working at the bar that produced the The Savoy Cocktail Book and carrying on the legacy of Ada Coleman, Harry Craddock, and Peter Dorelli. But from his bio , he worked hard to get there, starting right out of high school. While studying hospitality at home in Slovakia, he got interested in bartending, attended a bartending competition in Prague as a guest, and then signed on for a month-long bartending program there one year out of high school. While in the program he started bartending thanks to a connection his teacher made, and continued to bartend in Bratislava, the capital of Slovakia. He was a bar manager there as the cocktail scene there was just beginning. Looking to move forward in his career, he moved to London to learn English. He took a job as a barback cleaning ashtrays and such at the Attica club. Then he found a job bartending in a Japanese restaurant and was intrigued by the Japanese style of bartending, so he went to Japan to meet and study under the famousKazuo Uyeda. 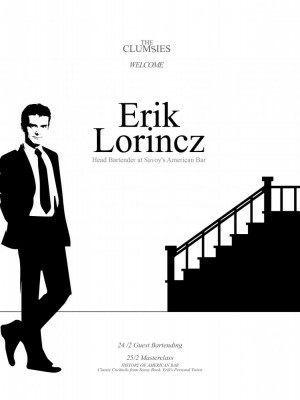 After his stint working in Japanese bars in London, Lorincz was able to apply his skills at the hotel bar at The Sanderson and then The Connaught. In 2010, he won the Diageo World Class international bartending competition (beating 9000 entrants) and started his position at the American Bar at the Savoy when it reopened on 10/10/2010 , where he stays until now. •February 24th Erik behind the Stick. Payment after communication, concerning ways of deposit and validation of your attendance to the Seminar.